Early this year I heard about a local angling club which had been setup to open fishing on a country park lake, on Brierley Forest Park near Sutton-In-Ashfield. This lake is within a couple of miles of both where I live and where I work, so I'd known it existed for quite some time and had heard that people would often "poach" there, because fishing wasn't officially allowed but was turned a blind eye to. I was really pleased to hear that a club was taking control of the lake, because one of the downsides to free, unofficial fishing is that it's totally un-policed. Anyone could fish there, however they liked, they could leave litter, thieve fish and use questionable methods and baits without anyone to check even if they had a rod licence. Through hard work and persistence, permission was granted by the appropriate local bodies for a newly formed angling club to lease the lake and and open it up to properly managed fishing. On June 2nd 2012, Brierley Park Anglers Association* will officially open up the pond to fishing with an open day at the water, featuring various family-orientated events and who knows, maybe even a visit from one of the club's high profile patrons, Bob Nudd, Keith Arthur, Julian Cundiff and Dave Williams. One of the things which impresses me most about the whole Brierley Pond project is that it has a real "community" feel to it, with a large emphasis put on providing angling opportunities for disabled anglers and children. Wheelchair-friendly pegs are being installed and tackle donations are being sought, so that on-site tuition can take place, to actively encourage youngsters and those with disabilities to take an interest in fishing. In conjunction with the Environment Agency, Brierley Park AA are installing numerous accessible fishing platforms and to fund these, club chairman Steve Savage came up with a novel way of funding them. He's asking bait & tackle companies, along with local businesses, to sponsor a peg, at a cost of £100 per season. For this price not only will the sponsor be helping anglers fish in comfort, they'll also get a name plaque placed on the peg and should the peg feature in any match-winning catches, it will be mentioned ion the website and in local media by name rather than by number (e.g. instead of "Joe Bloggs won with 12lb of roach from peg 4" you'll see "Joe Bloggs won with 12lb of roach from Terry's Tremendous Tackle peg"). If you would like to find out more about becoming a peg sponsor at Brierley, or can provide any fishing tackle to be used to help teach local disabled people and children to fish, please contact Gary Barfoot via the Brierley website or search for "Brierley Pond Community Project" on Facebook. I fished at Brierley during the winter and found it to be chock-full of silver fish. I was catching quality roach and rudd, more-or-less every cast. This was on a bitterly cold day and despite this, I was catching in less than 4 feet of water. The only conclusion I could come to was that I was casting into - to coin an old Yorkshire phrase - "One foot o'watter and three foot o'fish"! There are also a few carp well into double figures, along with lots of tench, bream, crucian carp, chub, perch and the odd surprise! The lake is just over a couple of acres in size and is quite shallow on the whole, with 3 or 4 feet being the average depth, but there is the odd trench and hole which go a little deeper than this. There are beds of Norfolk reeds, sedges and a few overhanging trees as features and one bank is completely fenced-off as a nature reserve, so the wildlife, as well as the fish, can get a little respite. Brierley lake has a healthy population of waterfowl with the standard coots, moorhens, mallards and swans sharing the water with the fish. 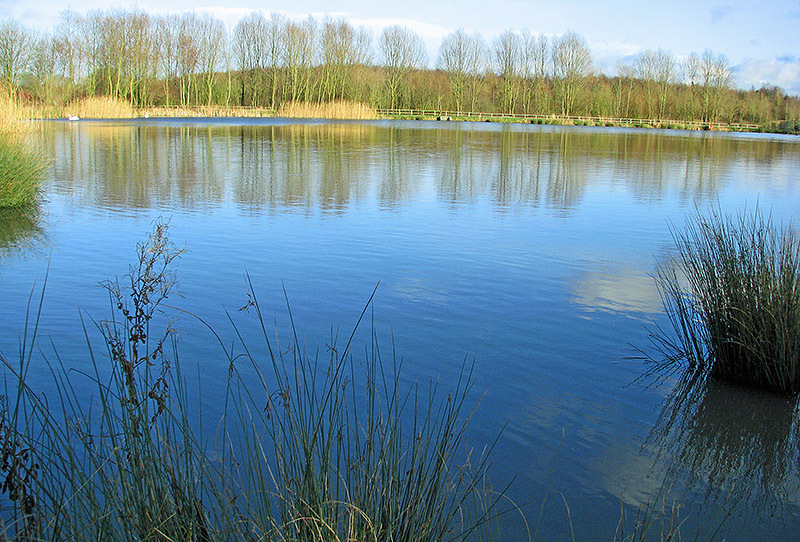 The lake is best suited to pleasure anglers, but it also has plenty to offer matchmen and the chance of landing an uncaught specimen; who knows what could be in there! You can now purchase season permits to fish Brierley for a very reasonable £30 per year adult or £15 juniors & concessions. There is a £6 joining fee for your first year. There are also day tickets available, but these must be purchased prior to fishing (they can be purchased days in advance, provided you know the date you're going to fish), from the Brierley Forest Park Visitor Centre & Cafe, located 250 metres from the pond, near the car park. A wide range of food and drink is also available. You can also browse or join the Disabled Fishing Talk forum, which I believe is moderated by Steve who is chairman of Brierley Park Anglers Association, at http://disabledfishingtalk.forumotion.com/f40-brierley-park-pond, where there is further info about the fishing at Brierley.